It’s never easy making a diet change to help you feel your best, and gluten is probably one of the most difficult items to eliminate from any diet. From bread to soy sauce, gluten shows up in just about everything these days. It’s commonly used as a binder in many starch products, and naturally occurs in a wide variety of wheat and other grains. However, your cuisine and palate don’t have to suffer just because you decide to go gluten-free for your health. In fact, you can even find many different supplements and medications these days that are gluten-free. One such supplement is Metatrol, the only fermented wheat germ extract on the market that’s gluten-free. You don’t have to miss out on wheat germ benefits any longer! While you’re at it, try out some of the following starches to add variety to your diet and please your palate while still remaining gluten-free. There are certain tried and true wheat flour alternatives that work well in both baking and for other products, like pasta. They’ve been around far longer than the gluten-free craze and they’re the most common choices for individuals who have been gluten-free most of their lives. Additionally, they’re easy to come by at grocery stores. Don’t forget to pick up some xanthan gum to use as a binder with these grains while you’re at it! Rice – Both white and brown rice make excellent gluten-free flours. They are light and don’t have any extra funky tastes that can come from products made from other alternatives, like beans. Brown rice flour is probably the closest you can get to traditional wheat flour without the gluten. Just remember, rice flour has no natural binders, so you’ll have to find alternatives for baking in order to keep everything from crumbling. Corn – When you think of flour, you probably don’t initially think of corn. But it’s actually been used as such in the Americas for hundreds of years. Corn flour has a distinct taste, but it’s mild. When mixed with other ingredients, it’s negligible. In addition, corn flour is excellent at binding ingredients or thickening sauces. Quinoa – While it hasn’t always been exceptionally popular, quinoa has gone from virtual obscurity to intensely popular in just a handful of years. Quinoa flour is an exceptionally versatile, gluten-free flour that is high in protein. It makes for great pastas and can be mixed into just about any flour blend. While rice, corn, and quinoa tend to take center stage when it comes to gluten-free flours, there are many options out there to help you find the perfect fit. It’s also fun to experiment with flour blends in order to get just the right taste and texture! Buckwheat – It may have the word “wheat” in the name, but this grain is actually a grass seed with no gluten in it. Buckwheat has a rich, nutty taste and typically needs to be mixed with other flours. However, it’s rich flavor does make it excellent for baking. Amaranth – This tiny seed is great cooked as is or as a gluten-free flour. High in protein and rich in flavor, you can toss some amaranth into just about anything. Making chili? Add some amaranth seed. Baking gluten-free biscotti? Mix in some amaranth flour. Chickpea – You’ve probably had chickpeas in hummus or falafel, but they also make a surprisingly good flour. Flour made from chickpeas does have a strong flavor, so use with caution. It’s best blended in order to reduce the strong flavor and improve the ability to bind. Chia – Chia is a tiny seed that can really pack a punch. Used in all sorts of foods, this little seed is high in fiber, omega-3s, and protein. It’s great to bake with whole or as flour. Just be careful to make sure the consistency of your batter is right because chia absorbs a lot of liquid. When you think of flour, you don’t typically look towards fruits, however, with the push for gluten-free, more and more flours are being created, including things like banana and hemp flours. Coconut – Coconut flour is a great addition to the gluten-free line of options. Made from dried and milled coconut meat, this flour is light, sweet, and perfect for baking! Coffee bean – This newcomer to the gluten-free scene is certainly making some noise. Made from the cherry fruit of coffee beans that isn’t used during the coffee production process, coffee bean flour essentially takes a byproduct no one wants and makes it into incredible flour. High in fiber, iron, and potassium, it’s a newcomer that’s certainly going to dominate the market in years to come. When it comes to being gluten-free, you don’t have to sacrifice anything anymore. 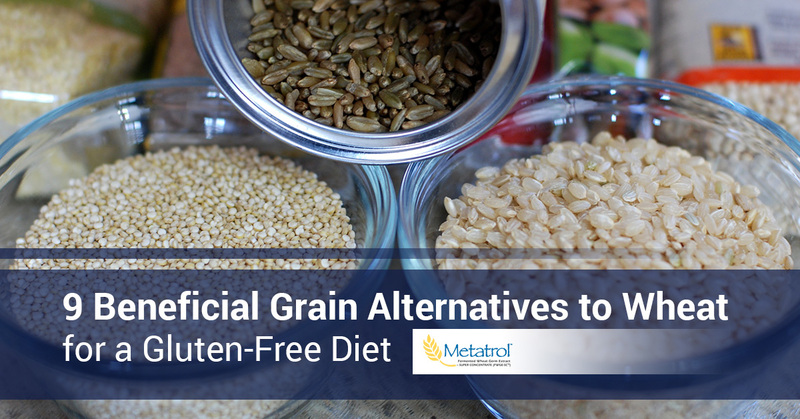 With all the different grain options available, alternative flours, and a greater awareness of the problems that gluten can cause individuals, you can live the healthy lifestyle that you want. Metatrol is just one supplement that makes it easier to get all the benefits you want without any of the gluten. Try it for yourself today!